Hello! You look nice today. That makes two of us. Eagle-eyed readers will note the lack of an Instagram filter in the above folder, and remember back when I sung the praises of blurring out the details so that one can better enjoy the whole. Not using filters is a Big Deal for me when it comes to my appearance. It shouldn’t be, but that’s Trans Life in the 21st century for you. So, what changed? Well, 3 months of hormones, mainly. I’ve also gotten pretty good with eyeliner, but it’s mostly the hormones. Three months on hormones and the results have been absolutely magical. I’ve got noticeable breasts, heavier thighs, smoother skin and my body hair growth has slowed. There’s been some subtle changes to my face, where what few edges I had in my round face have been softened to match the rest of it. Also, my nose has shrunk. All the cartilage in my body has shrunk. My feet are a size and half smaller than they used to be, and I’m an inch shorter. Of all the changes, that’s thrown me for a loop the most–I’ve been 5’11” with giant feet since I was 13. And it’s not that one inch or a shoe size is really that big a change, just that it changed at all. 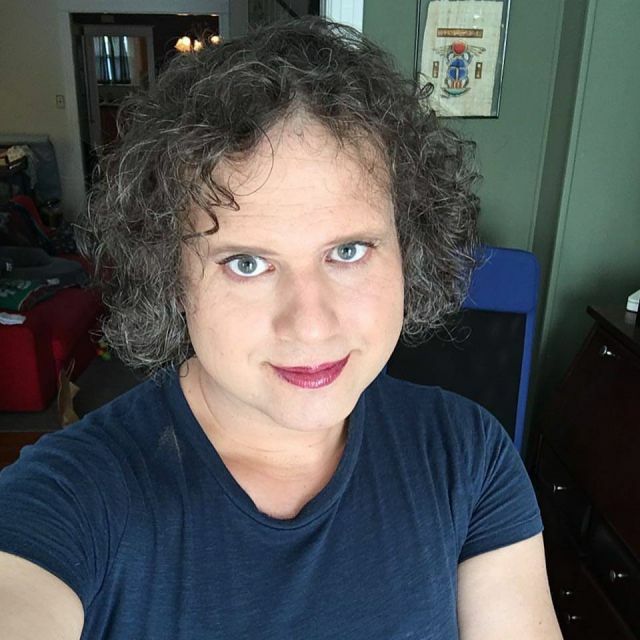 I don’t like to think of myself becoming an entirely new person–though I know a lot of trans folk do, and that distinction is something they need. I wanted to think of this as just another step in who I am, like when I started wearing ties all the time. But when there’s physical changes like this, it’s clear that there’s more going on. I look different than I did a year ago. Not a lot, but it’s there. And the changes are only going to get more pronounced. This is wonderful and exciting and…scary. It feels like one of those fairy tales where you find out the cost of getting your heart’s desire. I’ll finally be the “me” I always wanted to be, but I’ll have to figure out who she is. And I suppose that should have been obvious, but it only hit me when these clear physical changes started happening. Blame it on being a visual learner, I guess. I should add, that this level of change so quickly is not an average experience. In fact, I was mentally prepared for things to take a lot longer. Every body reacts to HRT differently. My body is either very comfortable with change–I used to put on muscle very quickly, too–or this is something my body has been wanting for a long time. Either way, I’m ecstatic that these changes are happening, and I am looking forward to see where they lead. And of course, there’s always Chapter 1, if you need a refresher. I really love this comic, and if you love it to, spread the word! The more people see the comic, the longer Quirk will have me do it! We took Wednesday to Target the other day, and came face-to-face with the merchandising juggernaut that is Star Wars paraphernalia. While fans of anything that has “Star” in the title, our house is mostly free of LucasFilm merch, beyond the odd t-shirt, art book and my hand-crafted lightsabers. 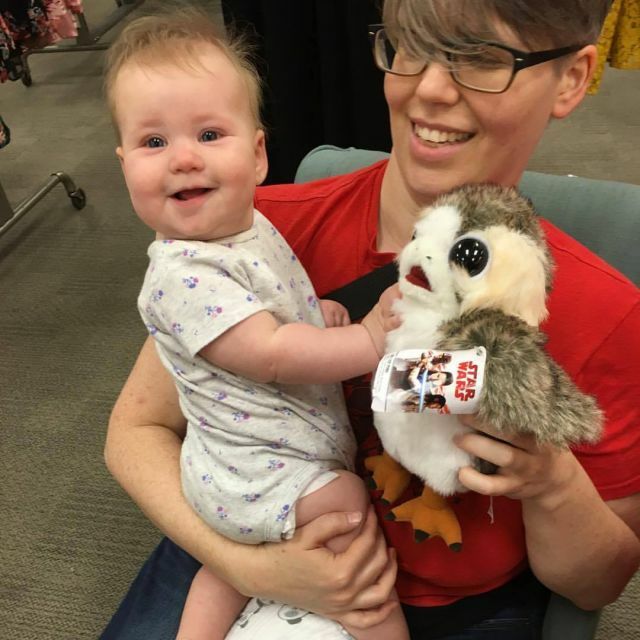 All that changed when our darling daughter came face to fuzzy face with a porg. Porgs, for those who don’t know, are little aliens indigenous to the planet Luke Skywalker has been hiding out on, and they are industrial-strength cute. Our daughter could not resist. She grabbed a stuffed plush porg off the shelf and didn’t let go. This is a pretty mean feat, as Wednesday has just learned how to control the “let go” function of her hands. The porg’s desirableness overwhelmed her love of grabbing things only to drop them. The fact that she held onto it for any length of time is a tribute to the designers. It also does these little chirping sounds when you squeeze it that make her giggle. So of course, we had to get one.